Print your own poster! Click here. 1. Significantly more money recirculates in your local community. 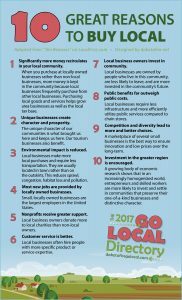 When you purchase at locally owned businesses rather than non-local businesses, more money is kept in the community because local businesses frequently purchase from other local businesses. Purchasing local goods and services helps grow area businesses as well as the local tax base. 2. Unique businesses create character and prosperity. The unique character of our communities is what brought us here and keeps us here. Our tourism businesses also benefit. 3. Environmental impact is reduced. Local businesses make more local purchases and require less transportation. They are usually located in town rather than on the outskirts. This reduces sprawl, congestion, habitat loss and pollution. 4. Most new jobs are provided by locally owned businesses. Small, locally owned businesses are the largest employers in the United States. 5. Nonprofits receive greater support. Local business owners donate more to local charities than non-local owners. 6. Customer service is better. Local businesses often hire people with more specific product or service expertise. 7. Local business owners invest in community. Local businesses require less infrastructure and more efficiently utilize public services compared to chain stores. 9. Competition and diversity lead to more and better choices. A marketplace of several small businesses is the best way to ensure innovation and low prices over the long-term. 10. Investment in the greater region is encouraged. 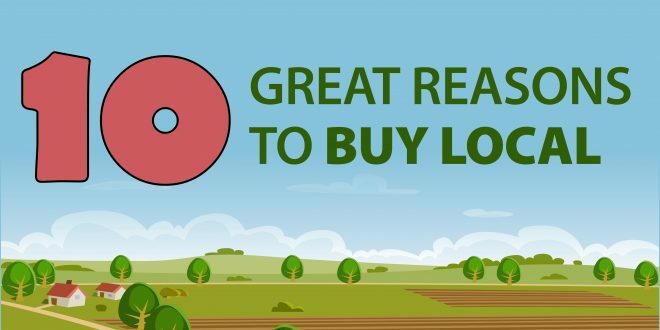 READY TO GO LOCAL? Search the directory! This list was adapted from “Ten Reasons,” posted on LocalFirst.com.